Tips To Prevent Your Home Security System From Being Hacked | Calgary Alarm Inc.
Statistics show that homes are 2.9 times less likely to be selected by a potential burglar if a home security system is in place. With the sharp rise in property crime in Calgary in 2015, it is important that homeowners are extremely vigilant with their security measures. In Calgary alone, 9,077 break-and-enters were recorded in 2015—that number amounted to one break in per hour, on a 24 hour basis, seven days a week. Home security systems, particularly wireless home security systems, are now equipped with the most modern technological features, including the ability to manage systems remotely. 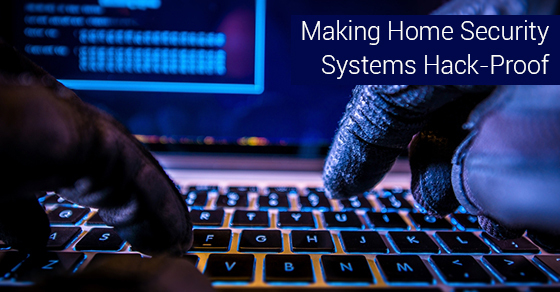 However, these features can make home security systems vulnerable to a particular type of treat: being hacked. It is important that you take the following measures to minimize this risk. When purchasing your home security system, ensure that you choose a system with encrypted signals over unsecured encryptions, as the latter can be easily accessible to a potential hacker. You can prevent hacking even further by choosing a system with tamper resistance features as well. An anti-jammer will be able to detect whether someone is attempting to jam your signal. Once you install this program on the device from which you access your home security system, you will be immediately notified in the event that someone tries to jam your signal. Install antivirus software on the computers from which you plan to access your home security system from. This will detect any potential viruses. First of all, ensure that you have changed the default password to one of your own. To make it as strong as possible, use a combination of letters, numbers and other symbols. Ensure that you also change this password regularly. Also: always keep your system updated, otherwise the risk of your system being hacked increases. If you access your home security system via a Wi-Fi signal, it is important to protect your router by password protecting your Wi-Fi. Avoid making your birthday or phone numbers your password, as this information can be easily obtained online by a potential hacker. Similarly, never access your home security system via public Wi-Fi. Always access it via a secure network when out in public. You should also limit the amount of devices that can access your home security system. Your laptop, mobile phone and desktop computer should be the only devices that can connect to your home security system. Consider Calgary Alarms for your choice of home security system—we are one of the best security alarm monitoring companies in Canada. Contact us today for more.